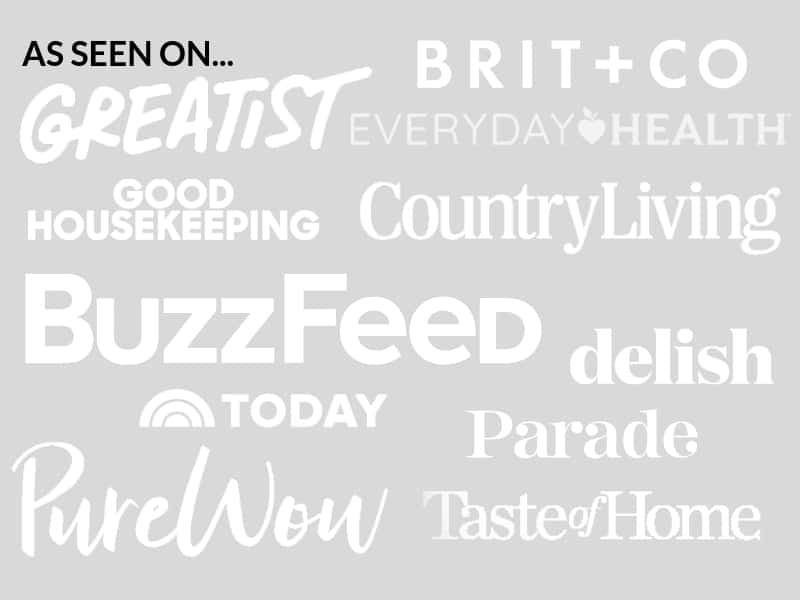 April 9, 2019 By Elizabeth Lindemann Leave a Comment / This post may contain affiliate links. Thanks, RiceSelect, for sponsoring this post! All opinions are my own. 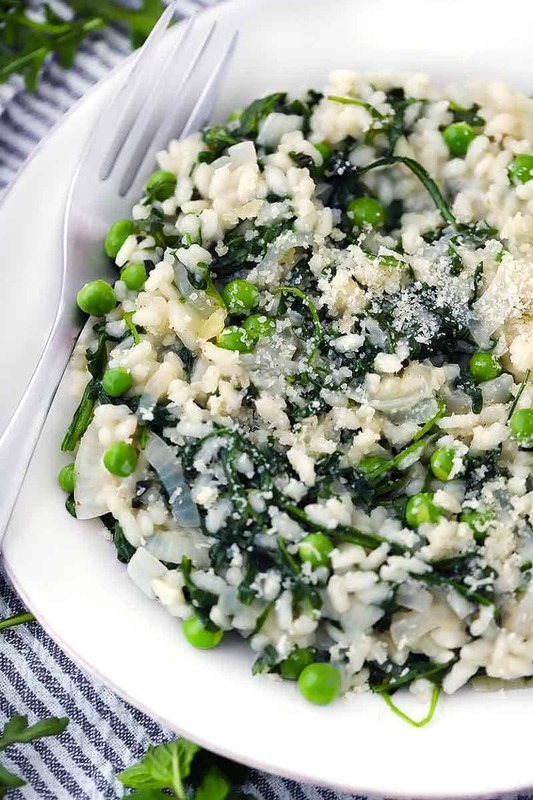 The Fresh Pea Risotto is bursting with flavor and the power of fresh greens in this delicious, plant-based, one-pot recipe. Fresh, peppery baby arugula and aromatic mint is wilted in to every bite, balanced perfectly with the sweetness of the fresh peas. It’s got the best of spring produce, but is great to make all year round (and you can use frozen peas, too!). Risotto is one of my favorite things to cook. Sure, it requires some pretty consistent stirring, but it’s also so easy in so many ways. And to me, the stirring becomes almost meditative. Stir stir stir, smell the goodness coming from the pot, stir some more, think about the meaning of life, stir some more. To me, it’s a great way to unwind after a busy day! Also, you don’t HAVE to stir it the whole time. More on that soon. I used RiceSelect Arborio Rice to make this. I’ve been an almost exclusive RiceSelect user for a while now, and I always make sure I have a jar of Arborio Rice, a jar of their Texmati rice, and a jar of their Orzo in my pantry. I used to think rice was just rice, but there is a clear quality difference that RiceSelect has. From the awesome reusable containers their products come in (I just repurposed one to be a shaker for fertilizer for my veggie garden! ), to the attention to detail that’s evident even when you just look at their products on the shelf in the store, RiceSelect has better flavor, quality, and texture than other rice brands I’ve tried. Next time you’re at the store, I highly recommend picking up a jar of RiceSelect rice products. And I definitely recommend using their Arborio Rice for this fresh pea Risotto! 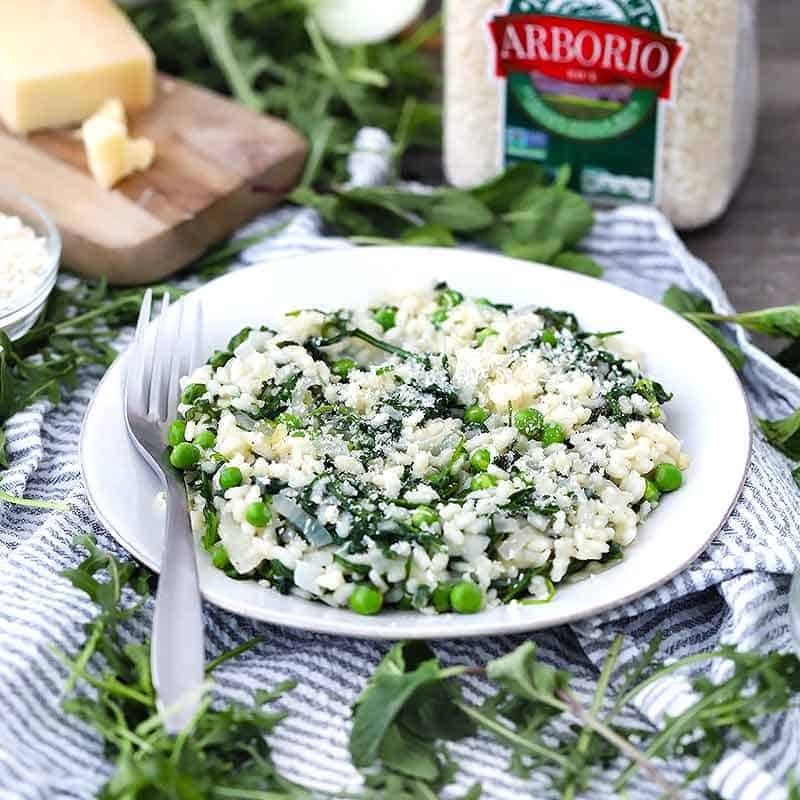 Arborio rice is the traditional type of rice used in risotto recipes. 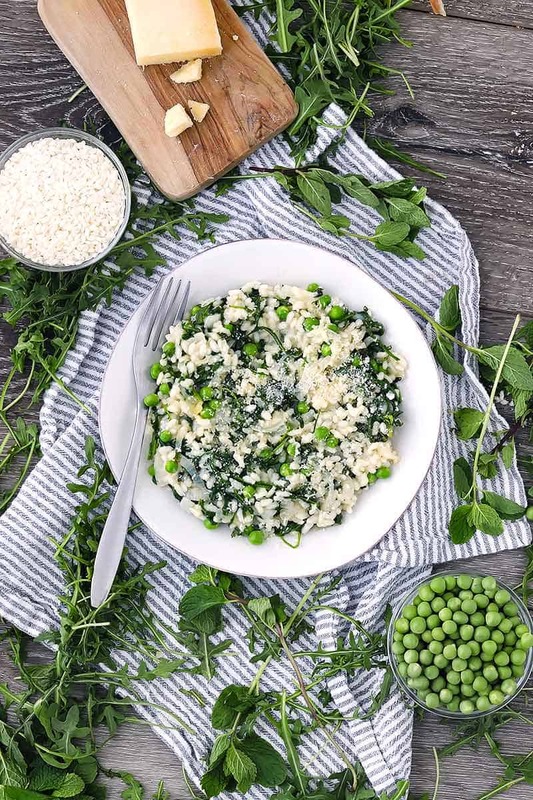 Risotto has a distinctly creamy texture, made possible not by the use of added dairy or tons of cheese, but rather by the starches released by the rice as it slowly absorbs warm broth. 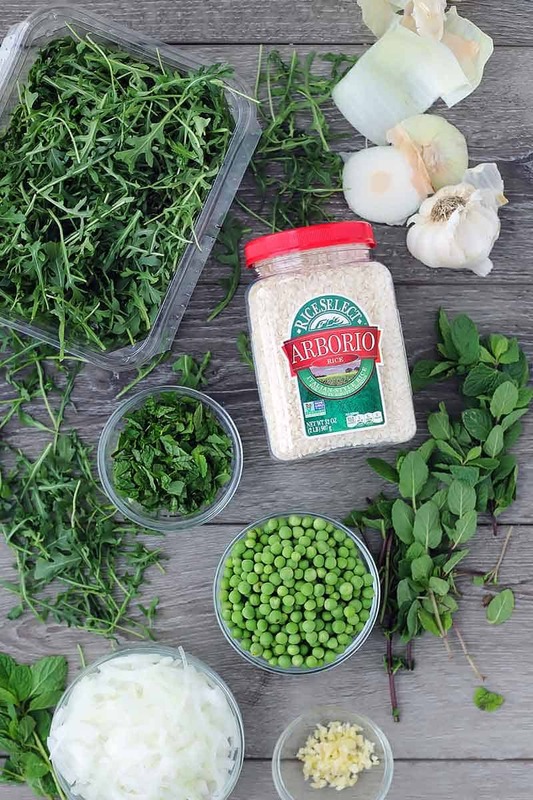 Arborio rice has tons of these starches that help create a super creamy texture in the finished risotto. This is enhanced by stirring almost consistently as it cooks to help release the starches. Do I really have to stir it the whole time? In short, you do not need to stir it the whole time. 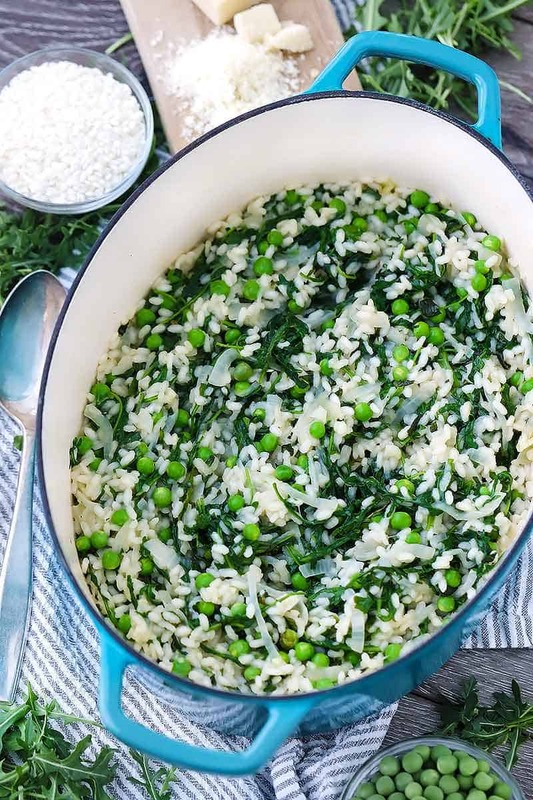 But the longer answer is that: more starches will be released by the rice the more you stir it, which will result in the creamiest possible risotto. If stirring is not your thing, or if you want a little more hands-off time to multitask (like cooking up some yummy poached salmon to go on the side), here’s what I recommend. You can add a little more broth, 1-1.5 cups, at a time. Stir for just a minute or so after you add each batch, then cover the pot and allow the rice to absorb the rest for about 10 minutes. This will give you a few breaks from stirring and still result in a creamy, yummy texture! 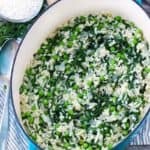 Did you make this Fresh Pea Risotto? Don’t forget to comment and Rate this Recipe below! 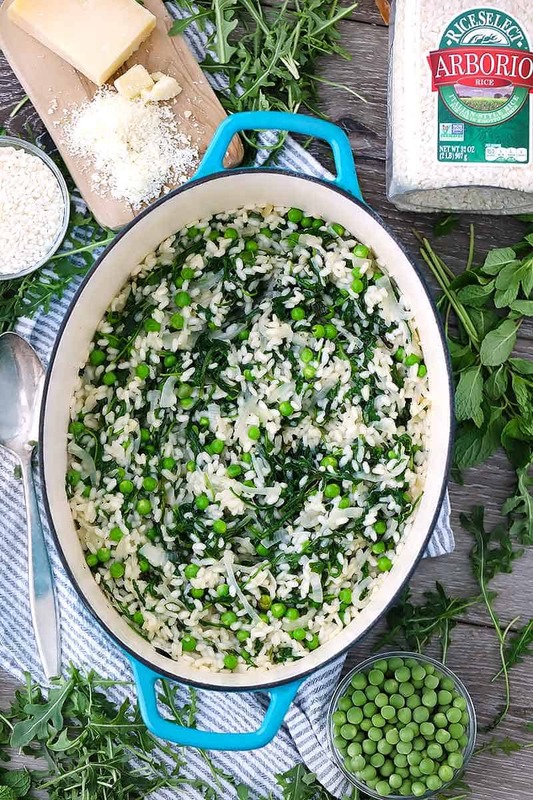 This Fresh Pea Risotto has the green power and flavors of fresh arugula and mint- a perfect plant-based, one-pot recipe! Heat olive oil (2 tablespoons) over medium heat in a large, heavy pot, such as a dutch oven or deep skillet. Add the sliced sweet onions and sauté until cooked and softened, but not too browned, about 5 minutes. Meanwhile, heat the chicken broth (4 cups) in a small saucepan, or in the microwave for a few minutes, until warm. Add the minced garlic (2 cloves) to the onions and sautè until fragrant, about 30 seconds. Add the arborio rice (1 1/2 cups), along with some salt and pepper, to the onions and garlic and toast the rice grains by sautéing until they begin to turn translucent on the outsides, about 3-5 minutes. Pour in the white wine (1 cup) and stir, scraping up anything that may be stuck to the bottom of the pot. Keep stirring until almost all the wine has been absorbed by the rice or evaporated, about 3 minutes. Add 1/2 cup of the warm chicken broth to the pot and stir almost continuously until almost all the broth has been absorbed, about 2-4 minutes. Keep adding the broth 1/2 cup at a time, stirring after each addition and allowing the rice to absorb the liquid, until the rice is fully cooked (about 20-30 minutes total). You may not need all four cups. Once the rice is fully cooked, add another 1/2 cup of chicken broth (if you've run out by this point, water can be used). Add the fresh peas (12 oz.) and arugula (5 oz. ), and stir in order to cover the arugula in some of the rice so it wilts faster. Cover the pot and continue heating for one minute, until arugula is wilted and peas are softened. Stir in the fresh chopped mint (1/2 cup) and finely grated parmesan cheese (1/2 cup). Season to taste with more salt and pepper, if needed. Serve immediately with extra cheese, if desired. Frozen peas can be used in place of fresh. Just throw them in frozen when you would normally add the fresh peas, and they should be fine! They may cook just a bit more than fresh, so the texture will be a little softer. For a vegetarian option, use vegetable broth instead of chicken broth. For a vegan option, use vegetable broth and omit the parmesan cheese. Omit just the cheese for a dairy free option. To save a bit of hands-on stirring time, add 1-1.5 cups of broth at a time. Stir for the first few minutes, then cover the pot and allow the rice to absorb the rest (about 10 minutes). « How to make Easy Peel, Perfect Hard Boiled Eggs EVERY TIME!